Woo Hoo! Tiki III is rescheduled. I've got the invites sent out and just waiting for the RSVP's. Until Tiki III happens, I thought I'd share some of the first annual Tiki party with you. I took oodles of pictures like I always do but they're all of my guests and not many of the decorations. 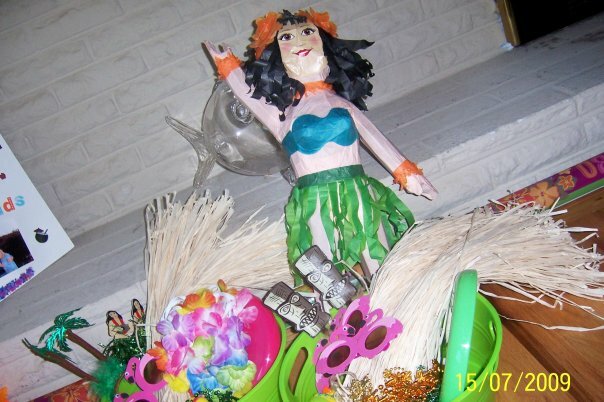 From the first annual Tiki party I learned that I need to take more pictures of the decorations. The more you throw parties the more you learn how to make them better. I wanted my guests to feel the Tiki theme as soon as they arrived. Fun for the kids. A pinata which they had a blast tyring to smash, hula skirts,leis, head boppers and glasses for silly fun and great photo ops. Yummers! The dessert bar. All the decorations you see are from the wedding. 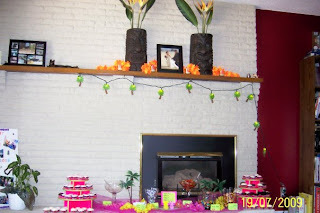 We had a candy/mini cupcake station at our wedding and I continue it every year at our annual Tiki party. I made the mini cupcakes, chocolate, vanilla and red velvet, a little something for every one. 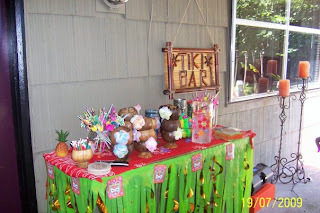 TheTiki bar. Everything you need for your drink. Fun straws, cocktail umbrellas, coconut cups and tiki mugs hiding behind the coconut cups. We used all these at our wedding too. Oh yeah, our wedding was FUN! Hope you enjoyed a look at our first annual Tiki party. Stay tuned for pictures of our second annual. Hey I was going to email you- but I don't have outlook...can you send me your email somehow. I can't access since I don't have outlook. Amy, that's odd because I don't think I have outlook either. hmm. Just stumbled upon your blog! Very cute site! Love how your party turned out! So fun! Jamielyn, Thank you. 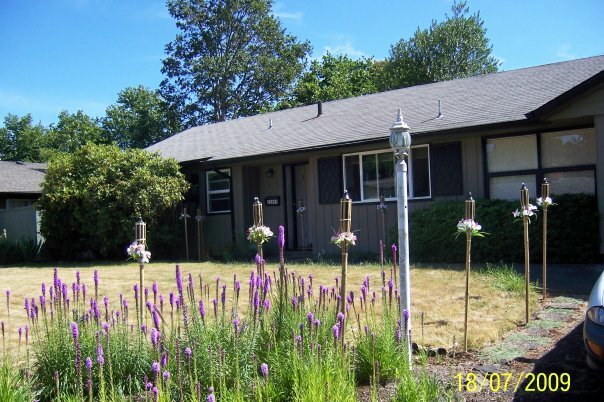 It looked so much better then that. I can't beleive I didn't take that many pictures. I'll be posting ones from the 2nd Annual party this week. And sneak peeks of the 3rd Annual. I'm glad you like the site, I'm still new to all this and hope to be tweaking it for the better :) as I learn more. Hee hee, off to work or I'll be late. Thanks for stopping by :) Woo Hoo!! 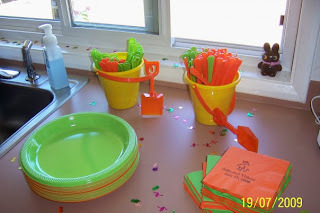 Such a fun idea for a party! Especially where I live in Florida, where just about everyone has a pool. Thanks for linking up with Hump Day Happenings.